Few businesses or organisations can ignore the power of social media, and particularly Facebook, which has over 2 billion monthly active users, making it a prime target for many businesses’ marketing efforts. As well as the domestic market Facebook is a very effective way to reach consumers in new markets, both in the B2C and B2B sectors. In fact, it can play an important role throughout a global expansion plan, providing a market research opportunity at the start, and culminating in on-going engagement and customer retention activities once a product or business has launched on the market. But to reach consumers in overseas markets you need to speak their language. This means not only translating Facebook posts but, more importantly, communicating with your customers in a relevant way. Often just translating your Facebook updates designed for the UK market is not enough. Instead, just as with many other marketing translations, it needs to be localised for the specific market. Can’t I use Facebook multilingual composer? Last year Facebook launched a new feature called ‘multilingual composer’. This allows users to select different language options (Facebook currently supports 44 languages including Pirate!) and translate your update into those languages. If a follower is using Facebook in one of those languages, they will see the right language translation in their newsfeed. However, if you have ever puzzled over a Facebook update in English from one of your international friends, you’ll know that machine translation is not 100% reliable and throws up some very odd translations at times. You may have thought that their English writing skills were not great, but it could be because they have multilingual composer turned on. The other reason I think that you need to avoid multilingual composer is that consumers engage better with a localised Facebook page / account. If you use your current Facebook business page for all markets you will be in danger of watering down content for your domestic market, confusing existing customers and prospects, and not projecting the global brand image you most likely want to promote. I think the best policy is to set up individual localised Facebook pages for each market. This way you can ensure that all the content on your page is relevant to the market. From the ‘about’ information directing followers to your localised website and contact details, to the photos, videos, reviews and calls to action. Do some market research to identify the most appropriate social media platforms for your company; there may be a local alternative that will deliver better results, and in some countries, like China, Facebook is not used at all. Set up a localised Facebook page for your target market. Fully translate and localise the About section and other features so that there is no confusion about who the page is for. Identify linguists from within your business who can help manage the Facebook page. Social media is all about engagement and therefore you will need people who can respond to comment and enquires in a timely fashion. If you do not have the resources internally, translation agencies like ourselves offer these kinds of services. Develop a monthly content plan that is aligned with your target market – don’t recycle Facebook updates from your UK page unless they are also relevant for the new market too. Get your updates translated by a native speaker to ensure accuracy, and that the tone and style reflects your brand in that market. 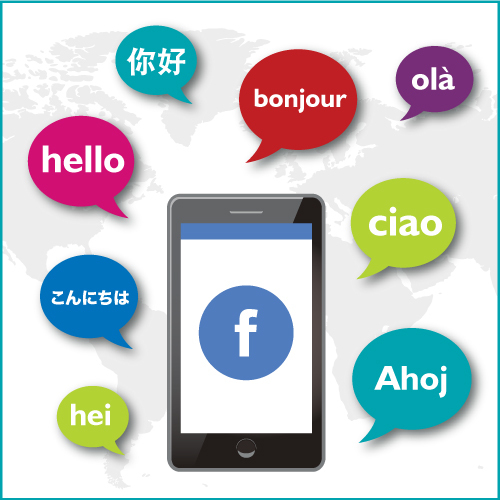 Please contact our team for more advice on translating Facebook posts, or find out more about our social media translation services here.